The newest take on Niskers is really just an expansion of the last one. They took the Niskers Char-Grill store on West Main Street, opened up in to the space that used to be B’Wiched Deli and Microcatering, and added a bar. 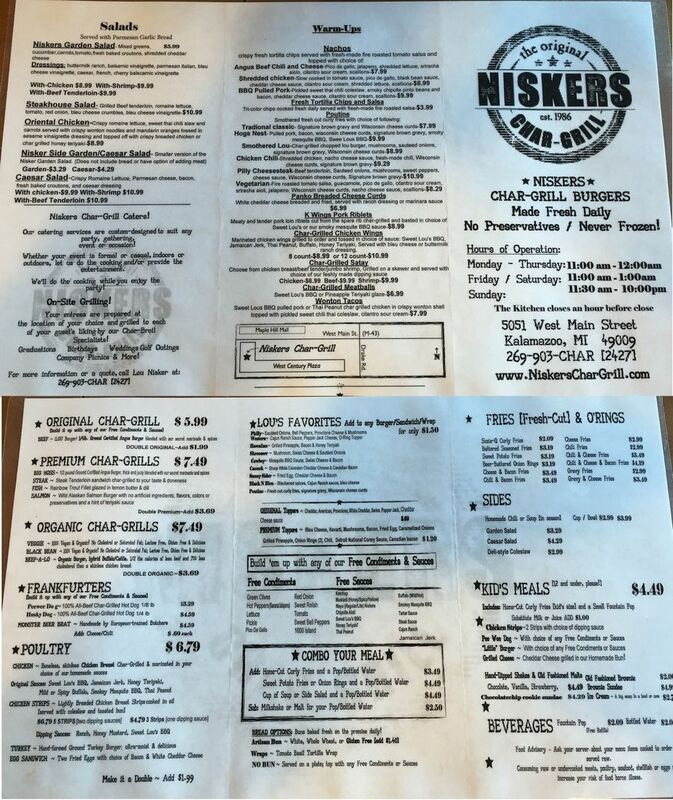 The Niskers name is still all over everything and the menu is still pretty much the same…just bigger. 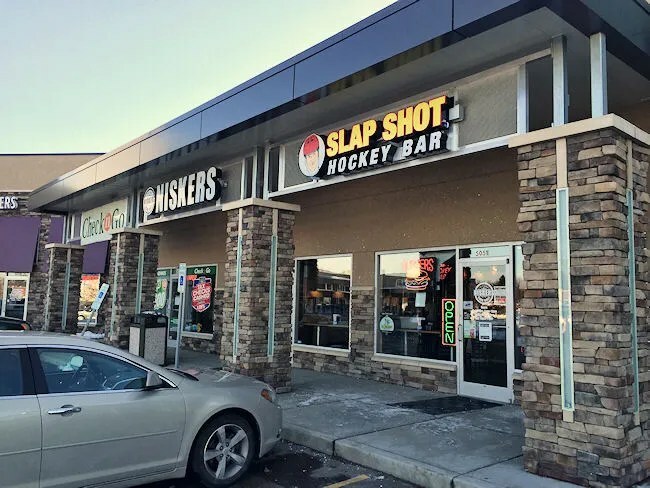 Slap Shot Hockey Bar expands on the Niskers concept. In addition to the bar that has been added, they added table service and more menu options. 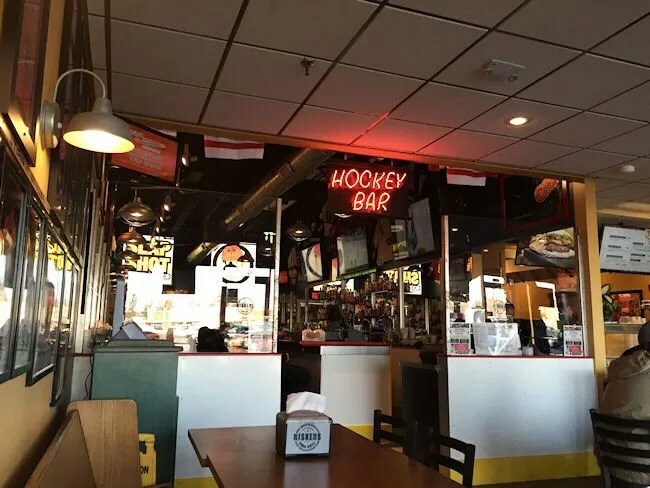 The burgers are still there, but more salads and the addition of appetizers make Slap Shot more of a full service restaurant. We were a little confused when we walked in because they do still have the service counter for take out orders. A waitress came out from the bar area which is kind of sectioned off from the rest of the restaurant with dasher boards and told us to take a seat and she’d be with us. The bar area is heavy on the hockey which makes sense. Owner Lou Nisker played professional hockey for many years including several with the K-Wings. We took a table fairly close to the bar, but it was still pretty early on Friday night. The waitress didn’t bring a drink menu, but my Mother-In-Law asked for one. I had already ordered a Coke by the time she asked, so I skipped the beer. It appears they have a pretty good tap list with a lot of crafts both on tap and in bottles. The burger I ordered is the same one I have had many times at Niskers. The Big Hoss served Sunny Sider. The Big Hoss is the name of the largest beef patty. It’s a 1/2 lb beef chuck patty mixed with their secret marinade and spices. The burger had an onion flavor to it, so I’m guessing onion is part of their secret spices. The Sunny Sider is a burger served with a fried egg, cheddar cheese, and bacon. All the sandwiches are served on fresh baked rolls. They call their white bun Artisan bread and this is the thing that really makes Slap Shot/Niskers stand out from other burger places. 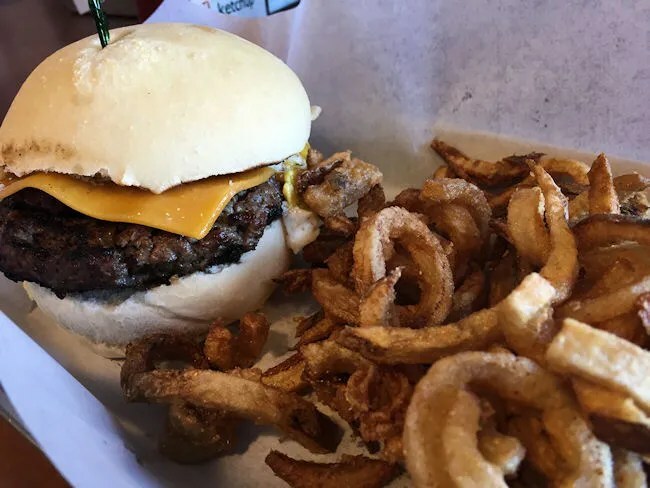 The bun is so soft and flavorful that you could put just about anything between it and you’d still notice how good the bun is. Luckily, they don’t just put anything between. They put fresh ground chuck patties that juicy, tender, and full of flavor. The toppings on my burger just sort of complimented everything else. The egg is was done all the way and the bacon was crispy, but a little on the rubbery side. I had thought that I asked for Battered Seasoned Fries for the side, but I got the Suzie-Q Curly Fries. They were still quite delicious, as they’ve always been, but I was hoping to try something different. No complaints on the mix up. I still got a golden brown, greasy potato and that’s what I was really looking for. J ordered the Chicken Sandwich and went a little rogue. She asked for sweet BBQ sauce, lettuce, pickles, and pepperjack cheese to be added to the char-grilled boneless, skinless chicken breast. 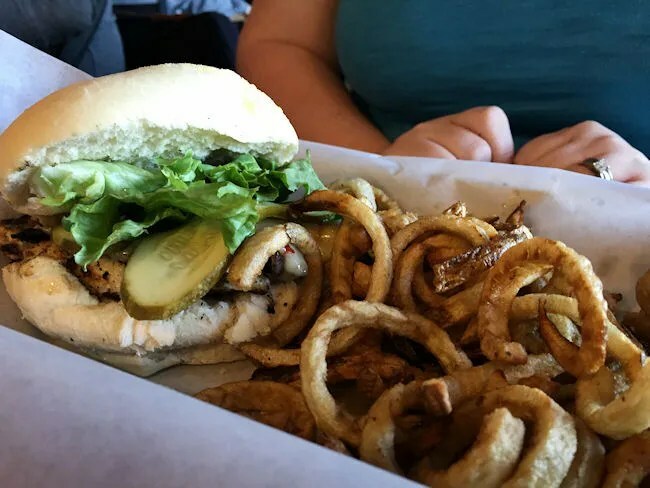 She was most impressed by the bun saying the chicken was good, but the bun is what made this sandwich something different. She ordered the curly fries with her meal and that’s what she got. L asked for a grilled cheese and they happen to have a kid’s menu with one on it. The sandwich is cheddar cheese on Texas “Michigan” Toast (that’s how it’s written on the menu). The sandwich was a little on the burnt side. Fine for me and you, but a picky four year old would only eat around the charred bits on the edges. She ate about half once we picked around the burnt edges. Her sandwich also came with curly fries which she happily ate. My Mother-in-Law also ordered a burger, but at this point, I don’t remember what she got on it. Like J, the thing she said really stood out to her was the bun. 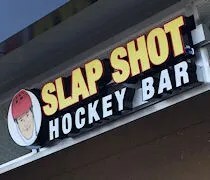 It seems odd that that is what everyone really noticed about Slap Shot, but that really is the conversation we had while eating. The bill for the four sandwiches, a beer, and two pops came out to around $40. I’ve always liked the restaurants Niskers has done and this one is no different. The addition of table service and beer is a positive thing in my eyes, but still having the quick carry-out option is pretty awesome too. 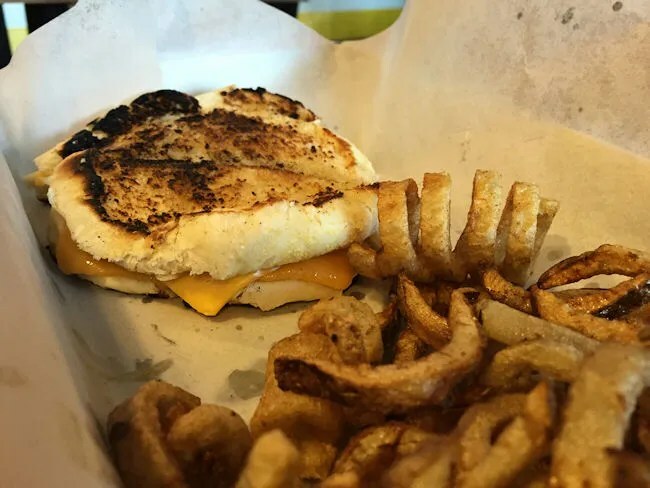 Niskers has always been a solid choice when we’re in a sandwich. They took something already pretty darn good and made it better.